SweatHawg helmet liners are the best way to keep sweat out of your eyes, and also keep dripping sweat off of your glasses. SweatHawg helmet liners are designed for use in any simple helmet without a face guard. Our unique helmet liner is a great way to keep run-away sweat out of your eyes, and to keep dripping sweat off of your glasses. So, no more burning eyes, no more smeared glasses! Helmet liners were SweatHawg’s first product, designed as a bicycle helmet liner. Comfortable, effective, and stealthy (concealed from view), these are now commonly found in the helmets of skaters, skiers, and motorcyclists. The helmet liner’s absorbency and aggressive wicking cools, while stopping dripping sweat. Bike Rumor put us up as “best product of its kind”! SweatHawg headwear is best for sweaty heads, guaranteed. The SweatHawg helmet liner is passively secured, you position it in the helmet in front of you, then lean forward, put your head in the helmet, and straighten up (see video below). As long as your helmet is a snug fit, it will then stay precisely where you put it, absorbing, wicking, cooling, and stopping dripping sweat.You needn’t bother looking for these anywhere else, to the best of our knowledge we are the only company that makes a helmet liner. That said, SweatHawg makes several other products that work well inside a helmet, most notably skull caps, do-rags, headbands, and cycling caps. Even cap inserts can be used, in passively secured mode. Whichever you prefer, each and every one will put an end to burning, stinging eyes and sweat streaked glasses. This is a great problem to be done with! Unmanaged run-away sweat is an annoyance, yes, and also a hazard. Burning stinging sweat can be blinding, and sweaty, smeared, and maybe dusty sunglasses are blinding also. So, go with SweatHawg. Forget sweat! Be safe and happy. Our helmet liners are ideal for anyone wearing a simple “lid”, skaters, skiers, equestrians, and especially cyclists. Placed entirely inside the helmet and therefore concealed from view, helmet liners are stealthy, and will not clutter a neat clean “look”. Helmet liners manage dripping excess sweat by absorbing, wicking, drying, and cooling. 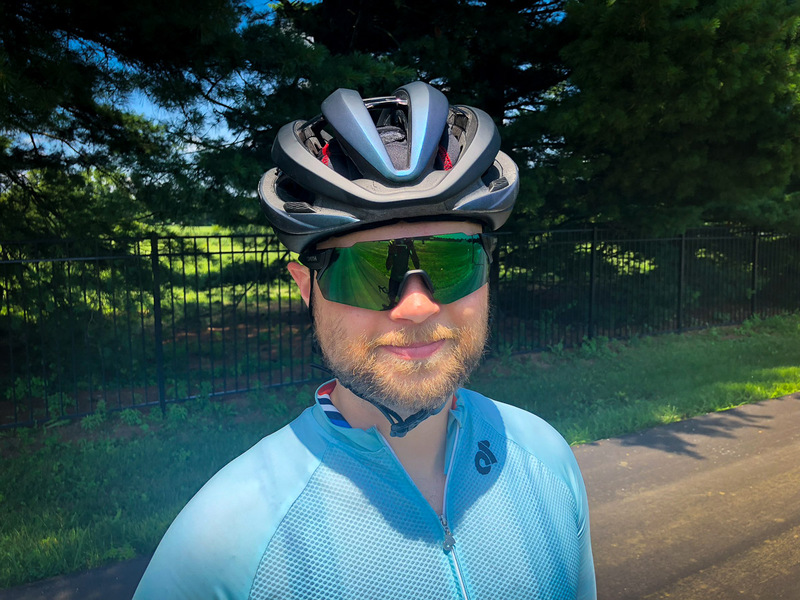 SweatHawg Helmet Liners are a natural, collecting sweat at your forehead and wicking it across your head, where your sweat can serve nature's intended function of evaporating and cooling. Yes! Our helmet liners are coolers, as water absorbs lots of heat while changing state from liquid to vapor. For humid climates, where drying is impaired, we offer helmet liners with a double layer of absorbency, the Helmet Liner X2. These hold more moisture, since evaporation is slowed by humidity. Helmet liners were SweatHawg's initial and original product, our "lightbulb product". The term “helmet liner” is sometimes used to refer to a skull cap, we offer those as well. Headbands, skull caps, cycling caps, cap inserts and hard hat sweatbands, all came later at the suggestion of our customers. All absorb, wick, dry, and cool. All serve to keep sweat from your eyes, and to keep sweat from your glasses. Like all SweatHawg products, our Helmet Liners are made in the USA. One size fits all. They come in a variety of styles including Original, X2 and Hook and Loop and X2 Hook and Loop. Great Pro Reviews by those "in the know".